As I mentioned in my post the other day, I've decided to participate in Bout of Books 11.0! I thought I'd share with you my goals for the week. Although it's very likely that they will change/I will not finish anywhere near what I've planned, I thought it'd be nice to show you my plan for the week. 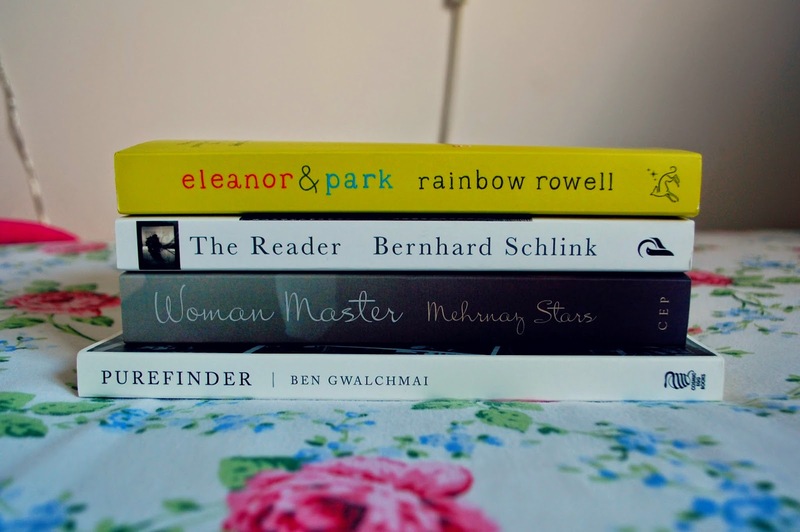 Top of my list is Eleanor & Park by Rainbow Rowell. I read Fangirl a few weeks back and absolutely fell in love with it and couldn't put it down so I thought another Rainbow Rowell book would be a good choice for a readathon! I've had two ARCs that I won through Goodreads First Reads sat on my shelf for a few months so I'm going to try and read at least one of them. They are Purefinder by Ben Gwalchmai and Woman Master by Mehrnaz Stars. I'm not sure if I'll get through both of them but I'm going to try and read at least one of them to tick them off the list! I've also got a few books I need to read before going back to school so I thought I'd throw one of them into the reading goals. The one I chose is The Reader by Bernhard Schlink which is the English translation of the text we will be studying in German next year. We've been asked to read the English rather than the German (thank goodness!) but I will probably try and read at least some of it with the German alongside it, just to gauge how difficult the language we will be studying is. So that's my aim for the week! Like I said, it's highly likely that this will change and I'll end up reading way less than I wanted to but I thought I might as well share with you what my basic plan is. I'm aiming to read about 800 pages I think in a week because that works out to just over 100 pages a day, something which is more than I currently read but is still achievable. Obviously if I go over that it would be great but I want to try and be realistic so I don't plan too much and make myself feel under pressure. Are you participating? Have you set yourself reading goals? Leave them in a comment below! I loved Fangirl too, can't wait to get started on E&P! Thank you! I'm also doing Bout of Books and am so excited! Thanks for the tip! I'll definitely make sure I have some at hand, I cry so easily at books! Nice goals. Lucky for you, that you can read that book in English. I had German for 3 years in High School and I was just so difficult! Hope you are better at it :). Good luck with all your reading, Lucy!